Picking one league winner before a ball has been kicked is hard enough. Picking two is impressive. Three? We’re getting greedy now. But what about seven? Yep, you read that right. Seven league winners across England and Scotland. Reckon you could’ve done that? A plucky punter north of the border slapped an optimistic tenner on three of the top four leagues in England and each of the Ladbrokes SPFL divisions, but would’ve thought he was onto a loser heading into the final weekend of the season in the EFL Championship and League Two. Doncaster Rovers and Plymouth Argyle have shared top spot in League Two for the majority of the season, while Portsmouth hadn’t spent a single day in first-place. That was, until the final day of the season. What a way to win a title! And of course, the punter in question (who wishes to remain anonymous) had backed Pompey at 4/1 last summer. 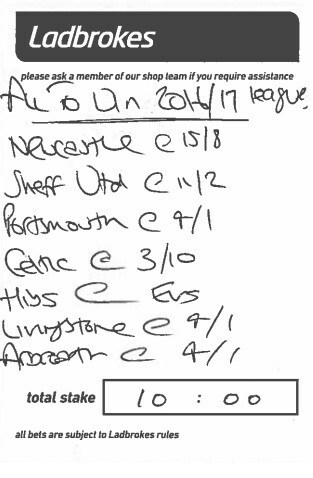 Like thousands across the country, this customer fancied Newcastle United to go all the way in the Championship. They hardly took the division by storm, and plenty will have been biting their fingernails for much of the season. But none more so than the man in question. 89 minutes into the weekend’s fixtures, the Magpies were doing their job, comfortably beating Barnsley, although that counted for nothing as they needed to better Brighton & Hove Albion’s result. The Seagulls were winning 1-0 away from home against a 10-man Aston Villa side and the league was theirs. Against all the odds, the Villa midfielder picked the ball up on the edge of the box and slotted away an equaliser. Brighton hearts were broken, Newcastle backers were buzzing. Elsewhere, Sheffield United, Celtic, Hibernian and Livingston all won their leagues with relative ease, while a 1-1 draw for Arbroath away at Stirling Albion was enough to ensure the Ladbrokes League 2 title would be heading to Gayfield. And in short, that’s how you turn £10 into just over £60k. Easy! Think you can top this next year? Let us know your tips in the comments section below!